The most asked questions at our support hotline regard to the success of the ExSBR routing decision. For many customers the ExSBR ruleset itself might be a little difficult to understand, for others the tracking inside Microsoft Exchange Server is too complicated. 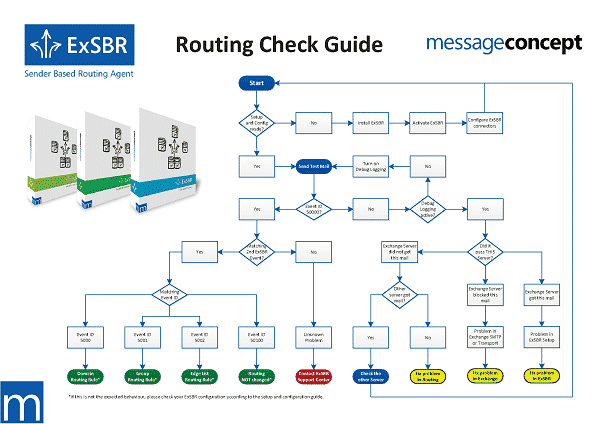 The flowchart diagram helps to drill routing issues down to the software component, which prevents a successful email routing. The chart considers beside messageconcept ExSBR, several Microsoft Exchange Server components and services. You get the guide for free with our evaluation version in the downloads section.